← Hey Honey! Yeah, YOU, honey. IT’S HONEY TIME!! Welcome back from your snack break and mini-yoga stretch! Let’s get back to talking honey. And, oh, what sweet, dee-licious honey it is. After spending the early afternoon up working with the hives, we had twenty full frames of honey loaded into the back of the truck. 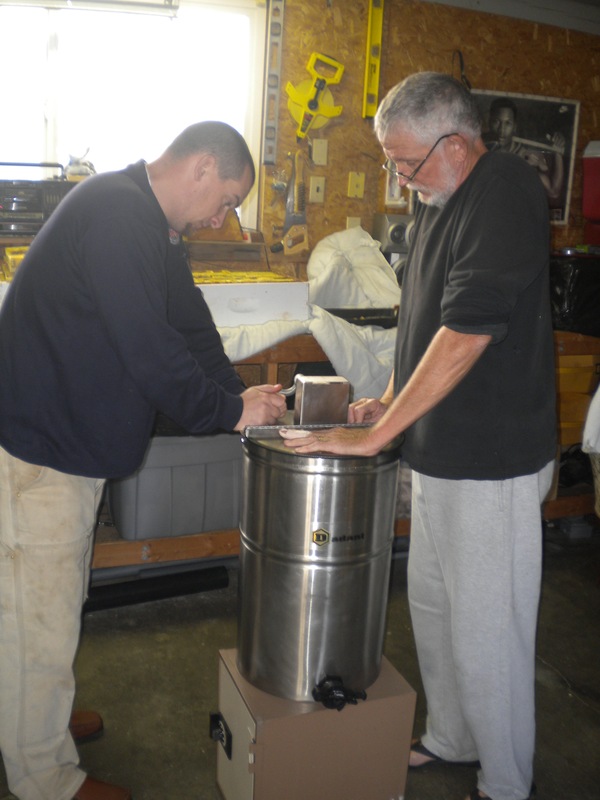 We headed home, about 10 minutes from the hives, and unloaded them into the honey extraction station in our garage. Beckett was down for a nap and we had an open window that was free from grabby hands, endless questions and general distractions. We had to make the most of the opportunity. Before I talk about getting the honey out of the frame, I think it’s important to talk about how the honey got in the frame. You agree? Bees have a honey stomach that holds the nectar they ingest as they move from flower to blossom outside the hive. Upon returning to the hive, the bee regurgitates the nectar (“honey”) into an empty cell. This nectar that they have brought back and put into storage is a watery, clear liquid and bears very little resemblance to honey other than its sweet taste. The bees work this liquid into its thicker, golden form by beating their wings and fanning the moisture from it. 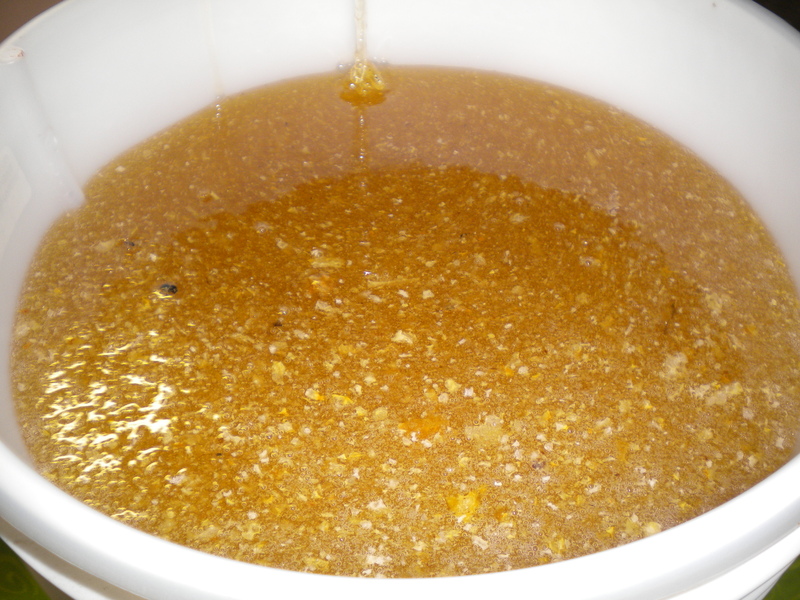 As the moisture is removed, the liquid becomes more and more intensely flavored and its consistency more viscous. 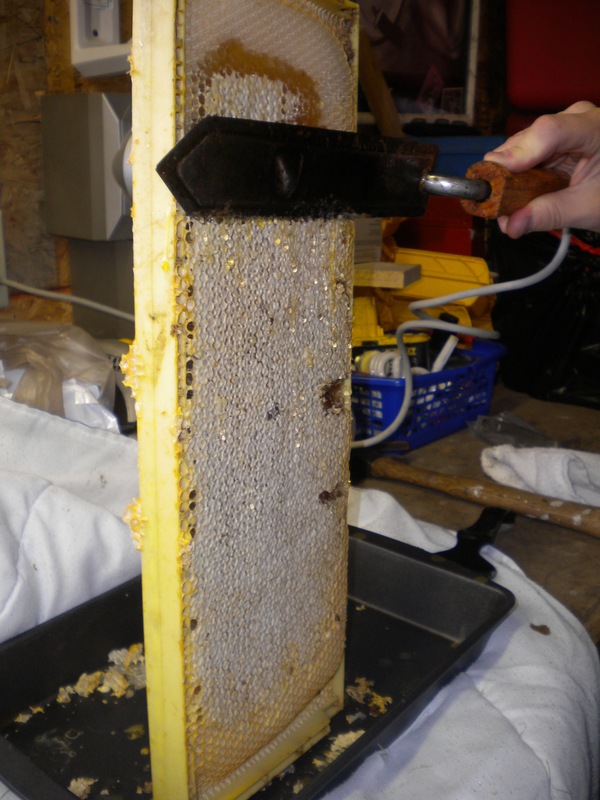 When the moisture content reaches at least 18%, the bees stop their fanning and cap the honey. 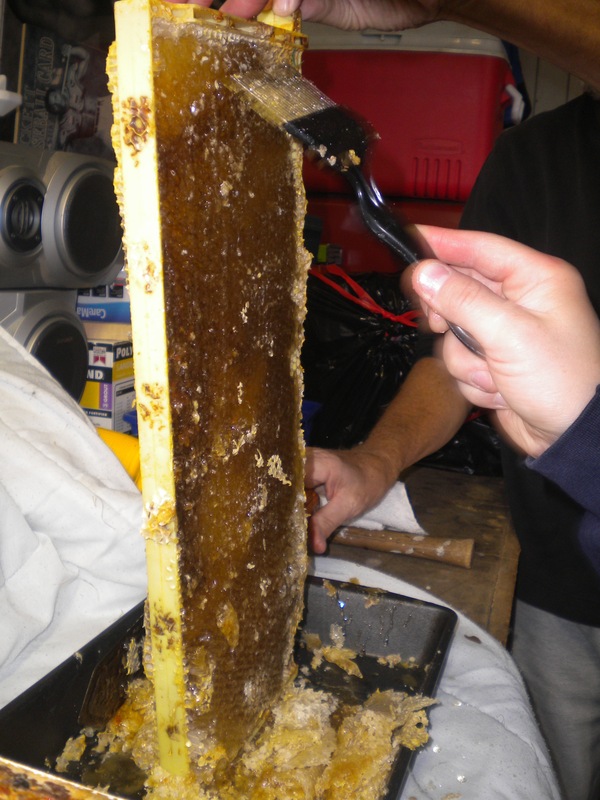 The cap is a thin layer of beeswax that seals and preserves the honey in the cell. 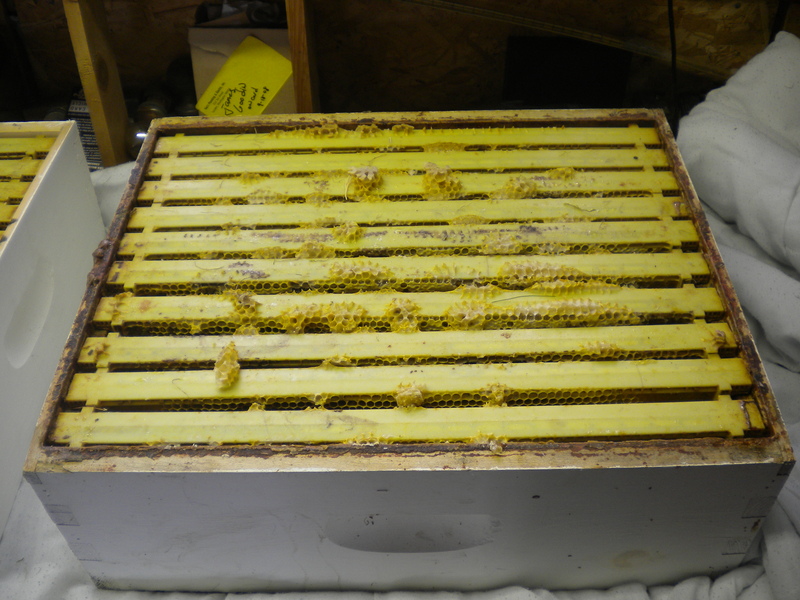 These are the frames that I am unloading from the hive – capped honey. 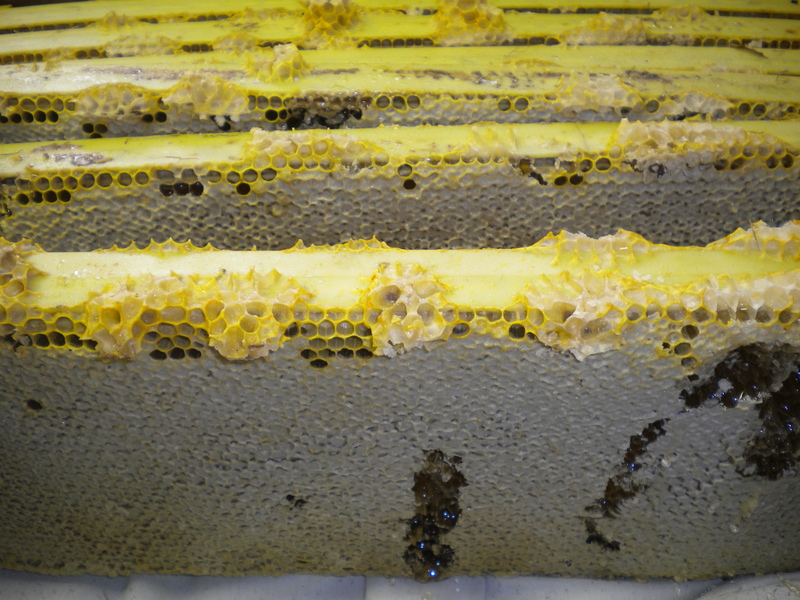 Each frame that is loaded with honey needs to be decapped. We had a hot knife that we used for the first few frames, but after a pungent odor began to smoke up from the knife, we set it aside. In the end, we opted for the old school pick-comb to scrape off the caps. The wax caps are held in a vessel of some sort that you don’t mind ruining – not the semi-new 9×12 sheet cake pan from under our stove – to be washed and melted at a later date. 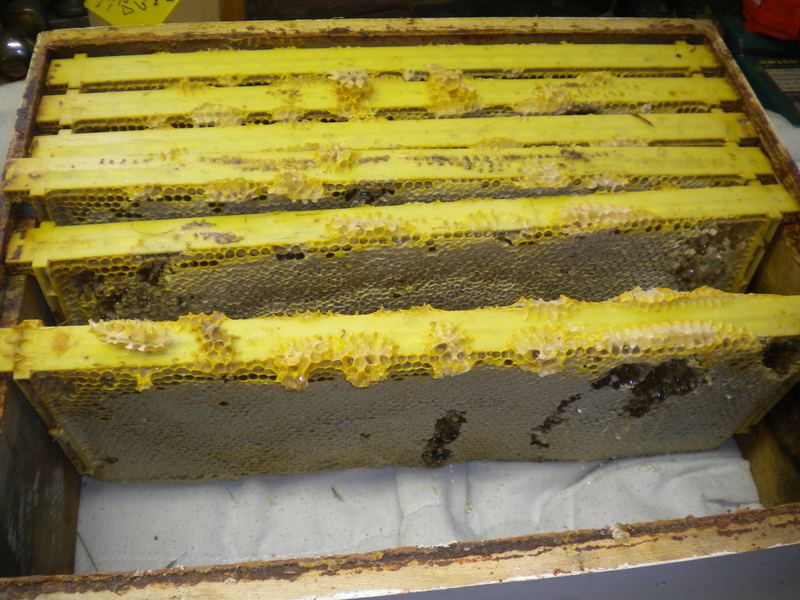 The hot knife has done its job, now it's time for the comb... FYI: the dark splotches you see in the frame are cells packed with pollen. With a final combing - the frame is ready for the extractor. 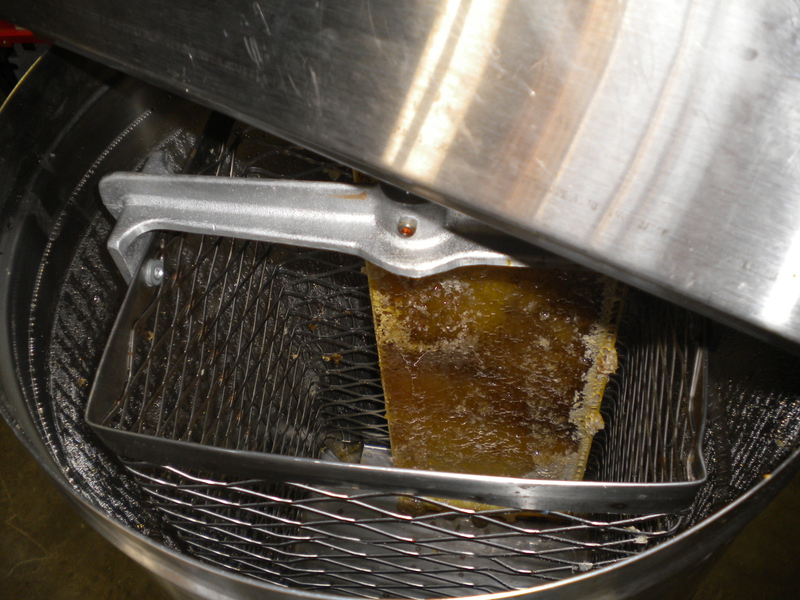 After decapping, the frames are moved into the extractor. Not sure what an extractor is? It’s a pretty simple, but oh-so-awesome contraption. Think of a centrifuge or washing machine with a basket suspended inside. The frames sit against the edges of the basket and when it’s spun – out flies the honey on to the sides of the barrel. 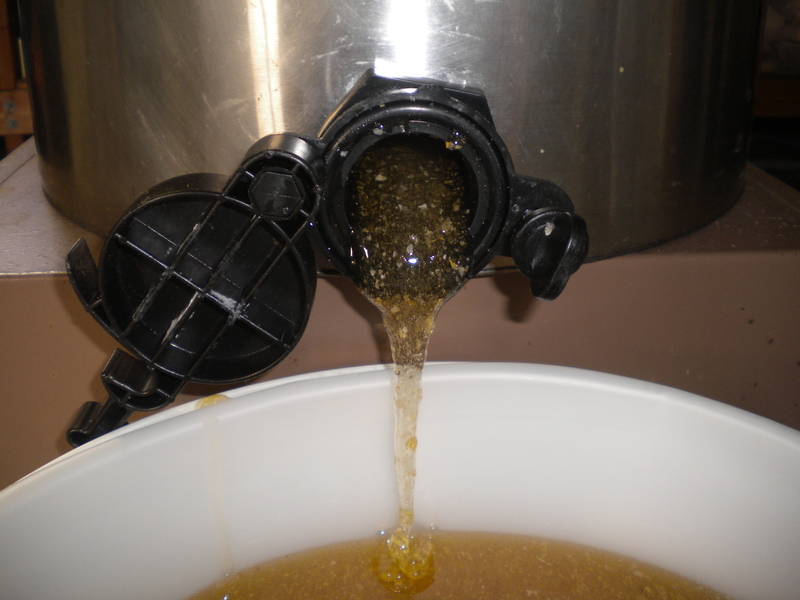 At the bottom of the barrel is a gate valve that opens and drains the honey out from the holding tank. Extractors can hold anywhere from two frames (that’s what we use!) to 200 frames (holy moly!) and can be powered by my manly husband or an electric motor. 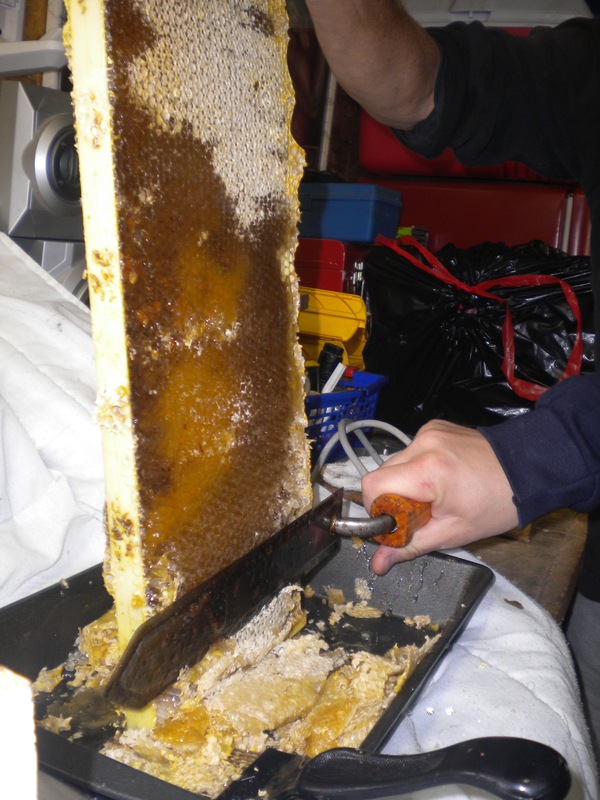 A two- frame, hand-crank extractor is just right for a small-scale beekeeper. Loading up that first frame - we're "officially" on our way to honey! At work with two grown men, four strong arms, one crazy photographer and a maniacally spinning extractor! The frames are decapped. The honey is flung. And, the extractor barrel is getting heavy. It’s time to open that gate valve and watch the goodness flow. 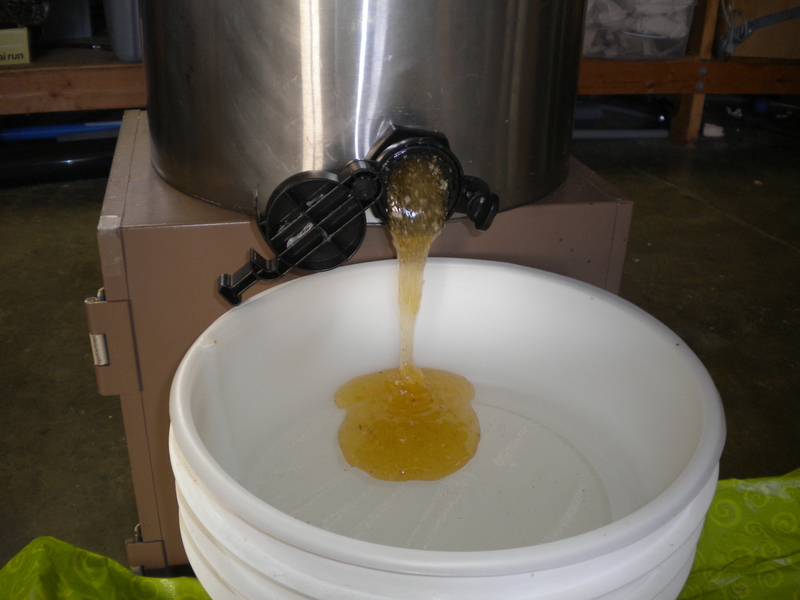 The honey is strained through a 200-micron filter screen into a 5 gallon bucket with another gate valve. This is the bucket that the honey jars are going to be filled from. Let the river o' honey flow! 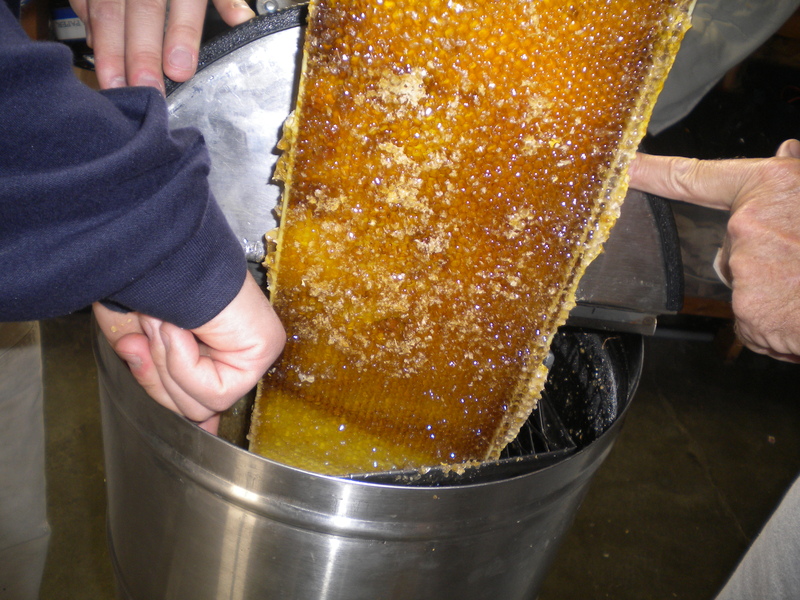 Another little tidbit of info – UNPROCESSED honey or RAW honey is exactly what you are getting from me. There has been no heating or any type of alteration to the honey other than straining the bees’ knees, bee bits and extra wax from it. It’s ALL-NAY-TUR-ALL! You simply cannot beat the taste of wild honey that is flavored with the area’s variety of nectars and bottled fresh from a hive. Its depth is like that of a fine wine – you can pull the subtle nuances and savor the delightful delicacy that is authentically regional and seasonal honey. 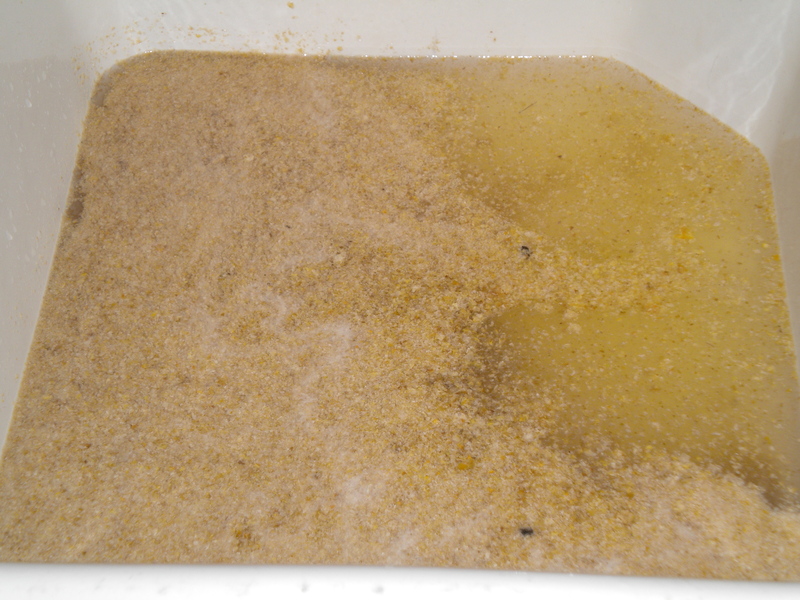 After moving through each frame and draining the extractor into a bucket – we were left with about 6 gallons of honey. It was now time to start bottling. 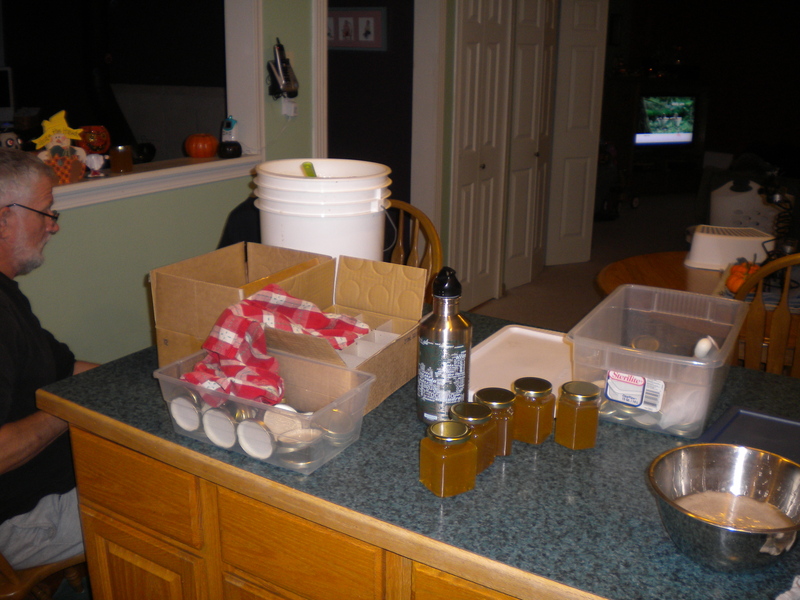 Our impromptu indoor workstation for bottling honey! Say "hi!' to my Dad! 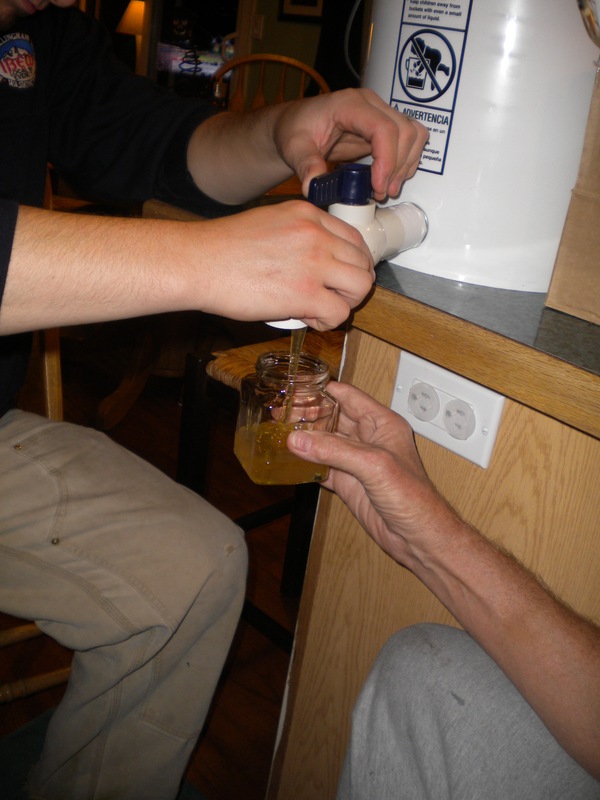 While the men perfected their bottling technique, I squeezed and washed honey and wax. 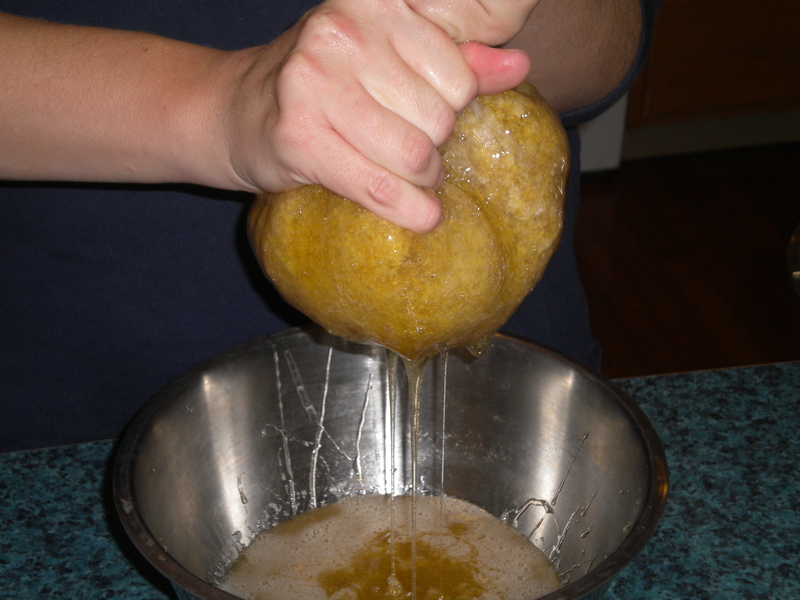 I was not about to miss out on almost two jars of honey that had glommed onto the wax cappings from the frames. And, I do love me some good beeswax candles (especially darling votives), so I prepped my wax and got it ready for a double-boiler bath later this fall. 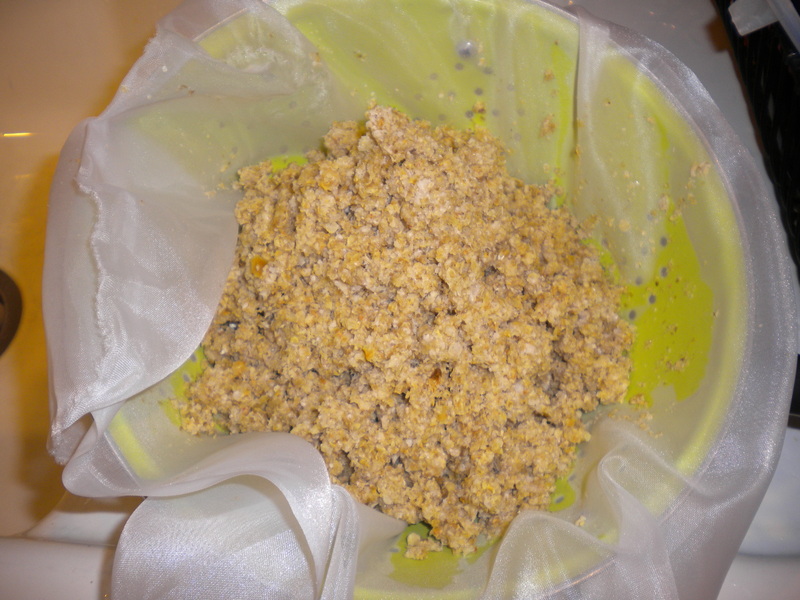 Beeswax flakes ready for melting and candlemaking. Now, for those remaining 10 frames… The wheels are turning and I haven’t given up hope. I’ll keep you posted. 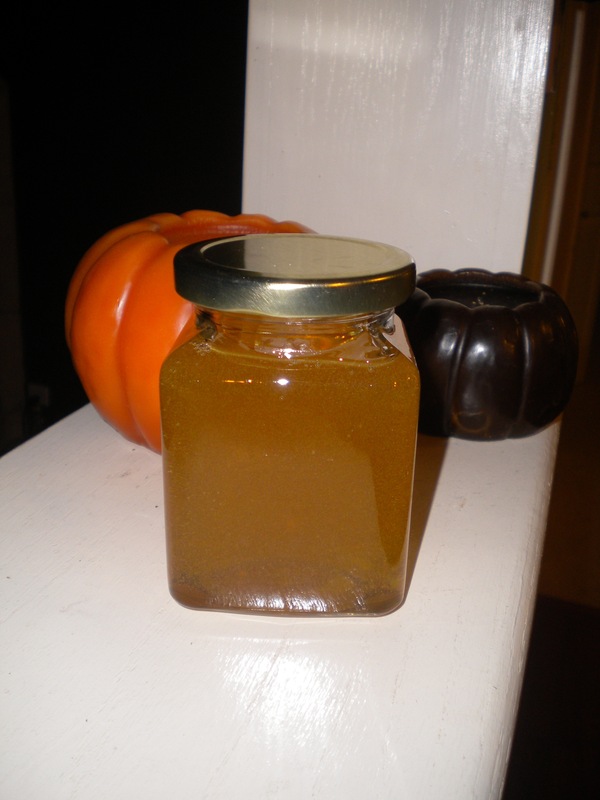 Thinking you want to get your hands on some dee-licious blackberry honey from the Sacred Bee? Send me an email to kate(at)sacredbee(dot)net. You can also check out the tab “SB Hive” (just below the blog banner) and see pictures and prices of the candles, soaps and honey. Can you say dee-licious blackberry honey?! SO cool to see the whole process! Well, I still have a some jars left – want me to put you down for more to bring in December?